Summary: Banished to Baffin Island to live with his Uncle Calvin when he needs to complete a year of community service for a drug charge, Jon’s motivation to stay in line is unlocking the trust fund his dad left for him to inherit when he turns 20. To do that, he needs the approval of both his mother and his uncle, and their collective opinion of him is quite low since his trouble. Living in the Inuit community of Nanuvik, Jon adapts well, throwing himself into his work as a music teacher at the local school and making friends along the way. As he grows to love his new life and falls for a local girl named Panee, Jon must decide whether to pursue his dreams of becoming a composer by going to school in the south, or give them up for love. 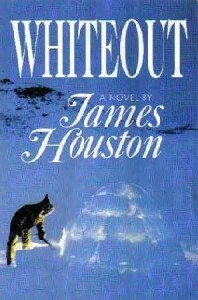 Review: Not only is Whiteout by James Houston an interesting and moving story about seventeen year-old Jon as he gains direction in his life, but it is also a fascinating look at life in a Hudson Bay Company outpost and Inuit community. As a result, I find myself liking it best for its historical aspects. Still, there are other parts to love as well. Houston has a vivid writing style that visually captures the North for his reader. I loved his description of Panee and Pudlo building an igloo when they went on their fishing trip especially, because I could see it in my mind. I learned more about snow blindness and the changing weather conditions up North, and even though Houston didn’t directly address it as Farley Mowat does in his writing, it is clear through his story that the land and nature should be properly feared and respected. Jon falls in love with what was then the Northwest Territories, and living there changes him. I personally didn’t need the love story part to see that, but it still worked, although I was bothered a bit by Panee seeming to be reduced to a commodity as she is the only eligible mate for Kudlik. Whiteout is a excellent story of character growth with elements of adventure. When I was finished I was happy Jon had found people that cared about him and a place to belong, although I wish somehow the ending could have been different. 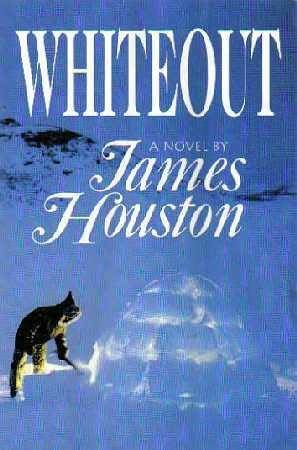 The Whiteout by James Houston, is published by Greey de Pencier Books, (1988).